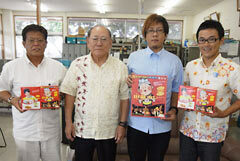 Kyu-bon curry, a product created through collaboration between the Okinawa City Tourism Association and Otsuka Foods. From August 13, the Okinawa City Tourism Association and Otsuka Foods, a company producing the Japanese well-known retort-pouched goods Bon-curry, will sell a jointly planned product called Kyu-bon curry. 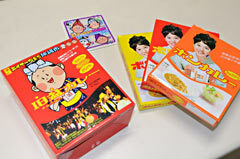 The Bon-curry is sold in Okinawa as a limited edition, using the same packaging that was first designed featuring an image of the Japanese actress Yoko Matsuyama. The new product was named after Bon-curry and kyu-bon, the bon festival of the lunar calendar. It aims to project Okinawa City as the home of eisa, the Okinawan traditional dance performed in the kyu-bon season. The price is 715 yen for a set of three levels of hotness, mild, medium and hot. The package of the set box features a character for eisa, Sa-chan, instead of Matsuyama. Part of the profit will be donated to activities designed to develop the eisa community. On August 2, at the Ryukyu Shimpo’s Chubu office, staff of the Okinawa City Tourism Association and Otsuka Foods promoted Kyu-bon curry to project Okinawa City as the home of eisa. On August 2, the head of the association, Tomikichi Nakamura, and Kazuhiko Horiuchi, who is a public affairs manager at Otsuka Foods, visited the Ryukyu Shimpo’s Chubu office. They commented how this is a combined effort designed to convey Okinawan traditional arts and tastes to future generations. The Kyu-bon curry will be sold throughout the year at a shop called Eisa-ya, in Music Town Oto Ichiba in Okinawa City. For further details, call the Okinawa City Tourism Association at 098 (989) 5566.